‘Main Event' on 1st to 4th June 2012. This televised event is the first round of the European Drag Racing Championship, featuring the biggest race entry anywhere in Europe. Over 200 teams and 17 bike and car race classes are unrivalled for quality and quantity of racing. The weekend, from Friday 1st to Monday 4th June sees the most brutal machines in Europe pitted head to head in an epic display of rubber burning, nitro-snorting insanity. Both cars and bikes are represented, with some of the entrants able to hit an incredible 300 mph in well under 5 seconds. is a sane way to make a living. Watching him cover the 440 yards in the blink of an eye, whilst literally hanging on for his life, is a spectacle that will stay in your mind forever. 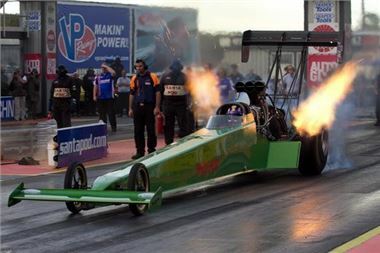 This years Top Fuel contingent will remember the very same event, exactly 10 years ago, where British racer Barry Sheavills re-wrote the record books by becoming the first driver outside America to shatter the all-important 300mph barrier.. followed a couple of hundredths of a second later by team mate Andy Carter. Barry will be attending the event, chatting to fans and signing autographs, so come and meet a real living legend. a ton-or-so of high-horsepower drift car. Off track action is equally as exciting with loads of entertainment and attractions aimed squarely at families looking for a great weekend away. Full camping facilities are available and under 16s even go for free. There's fun for the whole family with kids entertainment, side shows, traders, fun fair and full catering and bar facilities all weekend with evening entertainment in Fuelers Bar, including a live performance from rock band ‘Empire’ on the Saturday night and regular rockers ‘Slim 47’ on the Sunday. Don’t forget to look up from time to time though as The Battle of Britain Memorial Flight will also be making fly past with a Spitfire on Saturday, while Sunday’s sky will be full of the ‘Starduster Too’ aerobatic display. Monday completes the abundance of aeronautic excellence with a full team parachute drop to round things off. If you want to get up close and personal with an avionic icon, a static Battle of Britain display - featuring a replica Messerschmitt ME109 - will also doubtless be on your list. Fancy driving in the tyre tracks of the professionals? With 1,000 horsepower just inches from your ear? Then buckle up and sample the incredible sensation of a two-seater dragster ride. Covering the world-famous quarter mile in a shade over 7 seconds, you’ll experience the blistering-quick acceleration that only a top-level drag car can deliver. Advance ticket prices start from just £12 for the Friday, or £30 for each of the action packed main days (Saturday, Sunday or Monday) The entire 4 day event costing just £70 in advance or £80 on the gate. With the kids getting on for FREE, it could be the best family weekend that you’ve ever enjoyed.